“At Narni, St Juvenal, bishop and confessor”. ✴Gregory I, in the ‘Dialogues’ (Book IV, Chapter 12) had “the holy martyr, St Juvenal” appear to the dying Bishop Probus of Rieti. ✴The legend BHL 4615 that describes the theft of the relics of St Juvenal in 880 (see below) described this as his second martyrdom. (This legend is translated into Italian by Eduardo d’Angelo, referenced below, at pp.249-58). •a martyr from an unspecified location, who died on 7th May. A copy of the earliest known legend of St Juvenal (BHL 4614) is preserved under 3rd May in the Leggendari del Duomo. (It has been transcribed and translated into Italian by Eduardo d’Angelo (referenced below, at pp. 177--215). It records that St Juvenal was born in Africa and that Pope Damasus I (366-83) appointed him as the first bishop of Narni. Although Narni had been evangelised by St Terentian of Todi, St Felician of Foligno and St Valentine of Terni, it remained stubbornly pagan. St Juvenal erected a church dedicated to St Valentine, where he celebrated the mass and performed miracles. Such was his success that, on one occasion, he converted some 2,000 people on a single day. Five years after his consecration, he delivered the city from a barbarian attack, which presumably further enhanced his evangelical programme. He died on 7th August, seven years after his consecration and was buried outside the Porta Superiore of Narni. For reasons unspecified, his feast was celebrated on 3rd May, the feast of the discovery of the True Cross. The barbarian attack mentioned above apparently took place some 400 years after a similar attack on the city that had occurred when Octavian (the future Emperor Augustus) had been in the east, before he had returned to rebuild the famous bridge over the Nera. This places the attack averted by St Juvenal in 369 (i.e. 400 years after the Battle of Actium of 31 BC). Thus, St Juvenal was consecrated in in 364 (actually, in the reign of Pope Liberius I) and died in 371. “The hypothesis that seems most likely is that BHL 4614 represents the rewriting very early in the Carolingian period [i.e ca. 800] ... of an early medieval precedent ...” (my translation). In relation to this putative earlier legend, it is interesting to note the, as discussed above, Gregory I had referred to a cult site for the holy martyr St Juvenal in the 6th century. This might well have been in the basilica recorded in BHL 4614, in which the later bishops Pancratius and Cassius were probably buried (in 493 and 558 respectively). It is possible that the earlier legend had been written at the time of the recognition of the relics of St Juvenal and their translation to the basilica, possibly during the episcopate of Bishop Maximus but certainly before 493. As noted above, St Juvenal was buried outside the Roman city, close to Porta Superiore. This area seems to have been extensively used for early Christian burials: however, it is not possible to say whether St Juvenal was buried in an existing cemetery, or whether the existence of his grave stimulated the use of the surrounding area for burials. As noted above, St Cassius (bishop of Narni in 536-58) celebrated the Eucharist each day on the tomb of St Juvenal. This suggests that there was a chapel over the tomb by this time. 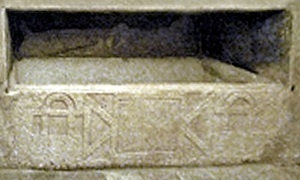 The existence of a funerary inscription relating to Bishop Pancratius (died 493) embedded in the wall of the present structure (see below) suggests that the original chapel was used for the graves of the bishops of Narni. Indeed, it is likely that St Cassius and his wife Fausta were also buried here (the former in 558). “Nec mora, sarcofaga rupta sunt, mausolea fracta, corpora sanctorum abstracta sunt, vehicula parata” (line 55). (Without delay, the sarcophagi are broken, the mausolea fractured, the bodies of the saints are removed, ready for the carts). Thus, amid a great display of mourning, Adalberto’s men took the precious relics to Lucca, where they were housed in San Frediano. However, Lucca was visited with so many natural disasters that its citizens soon decided to return the relics of St Juvenal to the pope in Rome. They were duly venerated in St Peter’s for a few days before the pope himself accompanied them back to Narni. The theft is usually placed at the door of Adalbert I, Margrave of Tuscany, who had participated in an attack on Rome in 878, an effort to force Pope John VIII to crown Carloman as Holy Roman Emperor. On this model, Adalbert I returned the relics of St Juvenal in order to secure the lifting of his subsequent excommunication. However, Edoardo d’Angelo (referenced below, at pp. 121-4) pointed out that the legend places the theft soon after the death of the unnamed pope who had refused to countenance Adalberto’s complaints. If this was, indeed, John VIII, the theft must have occurred after his death in December 882 and the restitution can have had nothing to do with his Adalberto’s excommunication. ✴Eduardo d’ Angelo, who believed that Adalbert I was certainly dead by 884, argued that there would have been only a short time for Adalberto to lay siege to Narni, steal the relics and then return them before his own demise. (Had the relics remained in Lucca until his death, the legend would surely have cited this as divine vengeance). ✴However, other scholars date Adalberto’s death to 886. In that case, he could have stolen the relics during the short reign of Pope Marinus I (882-4) and returned them at the insistence of Pope Adrian III (884-5) or Pope Stephen V (885-91). It has to be said, however, that it not clear that either of the last two popes could have enforced such a demand. ✴his son, Bishop John III of Narni (960-2), whom the Emperor Otto I appointed as Pope John XIII (965-72). On their return to Narni, the relics of St Juvenal were apparently buried in the rock below a new shrine (now known as the Sacello di San Cassio) that was built close to the site of his original grave. This shrine was later integrated into the present Duomo (which is dedicated to San Giovenale). ✴The relics of St Juvenal were rediscovered in 1642, placed in a new reliquary. In 1649, Bishop Gianpaolo Bocciarelli translated them to a new site in the crypt of San Giovenale. “The sarcophagus at Foligno which was contemporary with those from Giano, Narni and Spoleto, is assignable on the basis of [the shared] decorative motif to the 6th or 7th century” (my translation). The Corso all’ Anello is still held in Narni on the feast of St Juvenal. During these celebrations, a silver bust of the saint is taken in procession: the Commune commissioned this bust in 1703 in thanks for his protection of Narni from the earthquake that shook the surrounding region. As noted above, the cult of St Juvenal and his feast on on 3rd May must have been well established at terni by the time of the Hieronymian Martyrology (430s or 440s). ✴The author of the life of Pope Vigilius (537-555) in the Liber Pontificalis reports that the Byzantine general Belisarius founded a monastery dedicated to St Juvenal at Orte. •at Magliano, south of Orte, documented in 817. ✴Massacio painted the San Giovenale Triptych (1422) for the rural church of San Giovenale in Cascia di Reggello, which was close to the Via Cassia some 100 km south of Lucca. ✴The church of San Giovenale at Orvieto, further south along Via Cassia towards Narni, had this dedication from at least 1004. Return to Saints of Narni. Return to the home page on Narni.